EDIT: Giveaway is officially closed. Congratulations to the randomly chosen 242nd commenter, Kara Haskins! 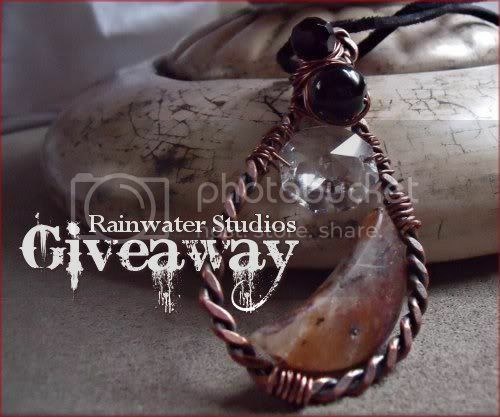 Wish upon the luckiest star and this magnificent moon necklace by Melissa of Rainwater Studios may become yours. The hammered copper wire has been twisted into a tear drop shape to frame a sliced agate stone and a Swarovski chandelier crystal. Melissa found the vintage crystal on a treasure hunt. The slight imperfections visible within its facets give the piece an extra touch of character. The wondrously wire wrapped pendant comes with a silky suede cord that measures 22 inches. Each piece Melissa dreams into being is just as unique and enchanted as this handmade prize. She has been creating jewelry inspired by different time periods since she began her theater career at 11 years old. A very crafty, ingenious group of theater gurus helped evoke her artistic passion. Historic times of turmoil, from Tudor to Elizabethan to Etruscan, especially fascinate her. Melissa uses her love of history, vintage jewelry materials and precious stones to craft treasures that mesmerize the eye and mind. Giveaway is open worldwide. I will be pulling a number from my random.org top hat after 11:59pm EST on January 5, 2012, and the corresponding commenter will win! Melissa will contact that lucky soul for a mailing address. If she doesn't hear back from the winner within 3 days, a new number will be drawn. Mandatory Entry: Browse the Rainwater Studios Etsy shop then comment on this post with your favorite handmade item and a way to contact you, preferably an email or Etsy shop. 1. Like that same item by using the facebook like button on the right sidebar of Melissa's Etsy listing and leave a comment here with the number of likes to the right of the button OR share it on your business page and include the link when commenting. 5. Like the Rainwater Studios AND aquariann Art pages on facebook for one extra entry. 6. Follow @myrainstudios and @aquariann on twitter. Following us both counts for two entries, as long as you leave a separate comment for each with your own username. 8. Follow the Rainwater Studios blog AND my blog on Google Friend Connect, Networked Blogs or your favorite RSS reader for one extra entry. I adore the Vintage Copper And Chandelier Crystal Necklace! Favorited the item and her shop! Pearl Swirl Art Deco Earrings, i like. Thanks for the giveaway! The champagne hair flower is my favourite! I like the Herkimer's Lady Necklace! My fav is the Bridal, Special Occasion Headpiece -Pearls And Rhinestone- Vintage Rhinestone, Swarovski Pearls, AMAZING!! I love her Victorian rose bridal head piece! Her bridal flowers are gorgeous, too. Very nice shop. I like the Herkimer's Lady Necklace on Facebook -my FB name is Amanda Moore and I was the first like! I gave you a Google +1 for this post! Love the eye of hera earrings! I'm the only one to like it so far (eye of hera earrings) as may equality shum! hearted both the shop and the item (eye of hera earrings) on etsy! Love the wire wrapped Amethyst earrings! I love the Egyptian Inspired Dragon Lace Agate Necklace. I like the same item by using the facebook like button. I'm the first to like this piece. I added that same item to my favorites and hearted her shop. I like the red berries earrings! I publicly +1'd this as Vicki S.
The Christmas Holly Wreath Trellis Ribbon Necklace is my favourite. Big, beautiful and very different! I have added the shop and my favourite to my etsy favourites. My favorite item is the Boho Chic Vintage Antique Brass Leaves Earrings. 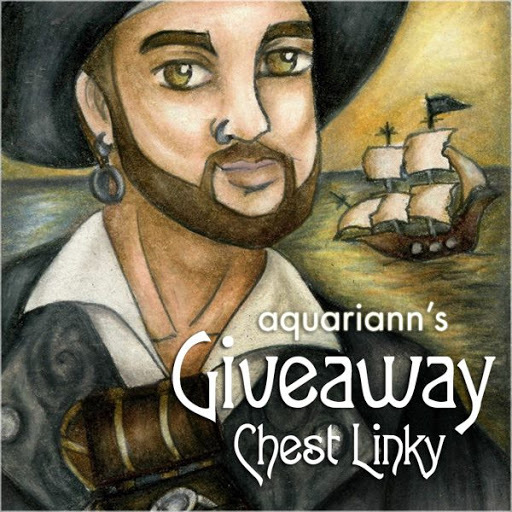 I liked Rainwater Studios and aquariann arts on Facebook. 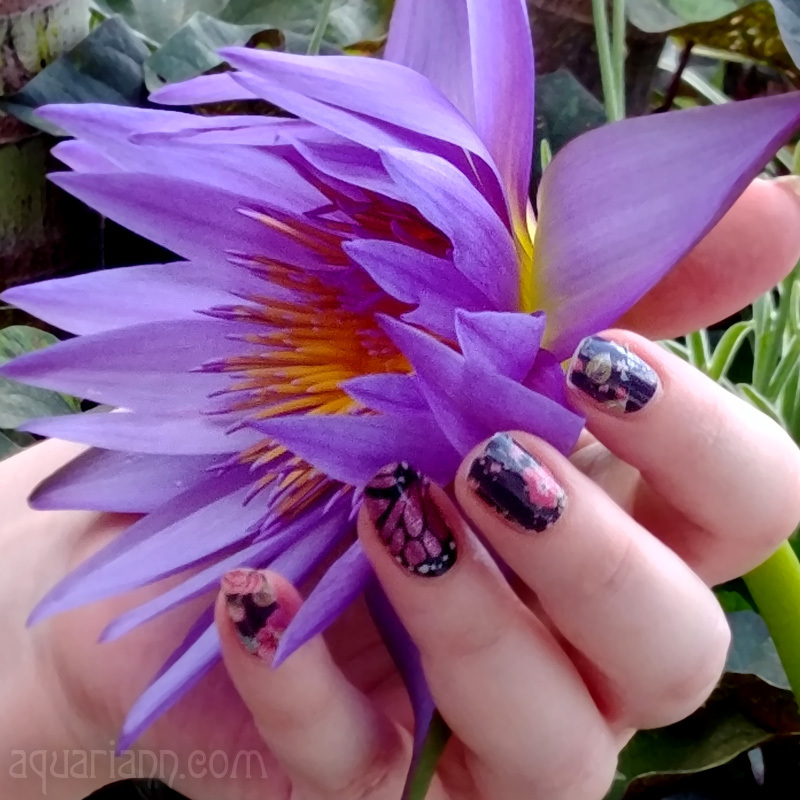 I voted for aquariann on Picket Fence Blogs. I reblogged your post on tumblr. Added Quartz Wire Wrapped Earrings to favorites and hearted shop. I like Quartz Wire Wrapped Earrings. I absolutely love the Vintage Copper And Chandelier Crystal Necklace-OOAk, Copper Patina,Swarovski Crystals. I added that item to my favorites and I heart her Etsy shop. I Voted for your blog by clicking Picket Fence Blogs. I like so many of them. So unique and lovely. I think I'd choose Sadie's Necklace if I were buying a treat for my own self. I like the Boho Chic Vintage Antique Brass Leaves earrings. I love the vintage copper and chandelier necklace! Christina - xristya@rock.com - I love the Guardian Of Time necklace! I really love the Snowflake Necklace, Swarovski Embellished Snowflake Charms!! Beautiful! I like the Snowflake Necklace, Swarovski Embellished Snowflake Charms with the facebook like button I was the first one! I am obviously in a holiday humor, because I LOVE the Christmas Red and Silver Holiday Bracelet! Soooo pretty! I'm the first one to LIKE my favorite item at the etsy shop! I hearted my favorite on etsy as hybroanglid. I also added the shop to my favorites on etsy as hybroanglid. I LIKE Rainwater Studios and Aquarian Art on Facebook. I forgot to include in my last comment that I also follow Rainwater Studios via Networked Blogs. I voted at Picket Fence! I +1'd this post on Google+! I love the Guardian of Time necklace! I voted on Picket Fence as well. The Lime Green Trellis Ribbon Necklace is my favorite item - it is lovely! I love the upcycled Coca Cola bottlecap earrings! Daily I voted on Picket Fence. Their "Chaotic Necklace-OOAK, Aqua Chalcedony, Black Onyx, Abalone, Wire Wrapped" caught my eye at the Etsy shop! My favorite item is the ple Dragon Lace Agate Bracelet! I liked the Purple Dragon Lace Agate Bracelet on etsy (etsy name: rammay; FB name: Annie Erlich). I was the first Like! I like the Starry Nights Pendant. I love the Starry Nights Pendant, Sapphire Swarovski Pearl, Grey Pearls, Resin, Faery Dust! Liked the Starry Nights Pendant, Sapphire Swarovski Pearl, Grey Pearls, Resin, Faery Dust! 2 likes so far. I like the Upcycled Bottle Cap Earrings.